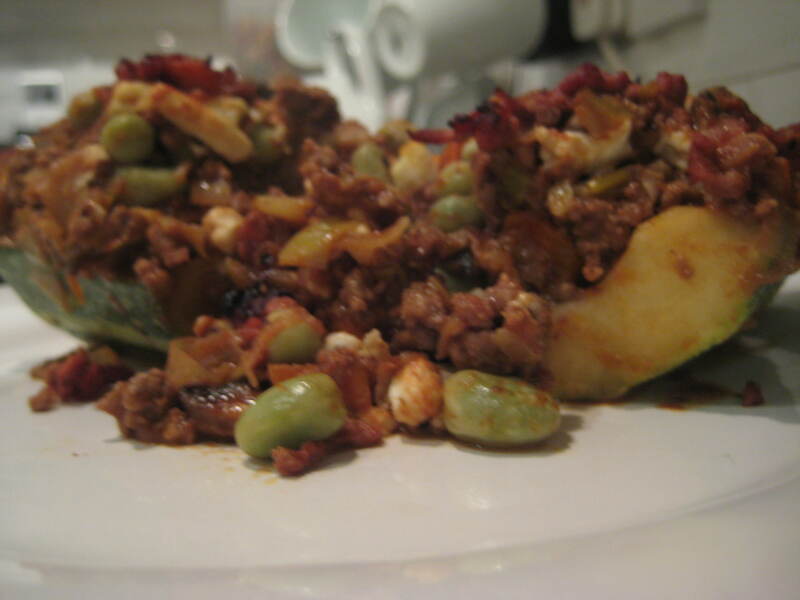 Marrows are in season at the moment and this is a dish that uses marrow as a kind of alternative to mash. It’s a cosy dish that you can prepare ahead and then pop into the oven to cook whilst you go out for a nice walk and it’ll be ready to enjoy when you get home. 1. Heat your oil in the pan and then add in your onion and peppers. Cook until they’ve softened and then add in the mushrooms and mince and cook for a further 3 minutes. 2. Add in the passata and broadbeans and stir well with plenty of seasoning. 3. Take your marrow, slice it in half long ways and then scoop out the seeds – add these in to the pan with the rest of the mixture and stir in. 4. Lay the two pieces of marrow skin side down onto a baking tray so that they’re snug to the edges and supporting each other. The spoon over the mixture from the pan to fill each of the marrows. 5. Roughly chop the feta cheese and then sprinkle it all over the tops of the mixture in the marrows. 7. 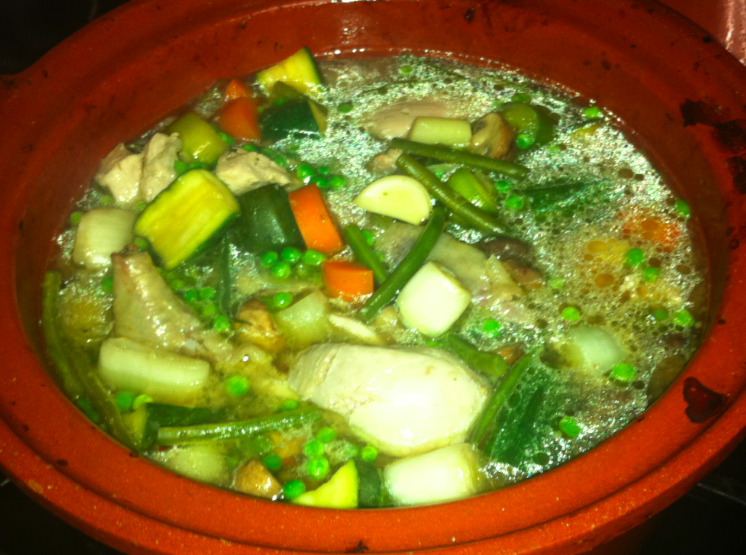 After 30 minutes, remove from the oven and spoon over all of the juices that have escaped into the pan. Return to the oven for a further 5 minutes and then you’re ready to slice each marrow into three large pieces and serve two pieces to each person with plenty of the lovely mixture and juices oozing out. 2. Turn the duck fillets and add to the wok your ginger garlic peppers and onions. Keep everything moving in the pan for approx 5 minutes, or until your pepper and onions have started to soften. 3. Add your noodles and pac-choi and cook for a further 3 minutes, constantly tossing the ingredients in the wok. 4. Remove the duck and place to one side for a couple of minutes, allowing the meat to rest. Add the soy sauce to the wok and mix well into the ingredients. 5. 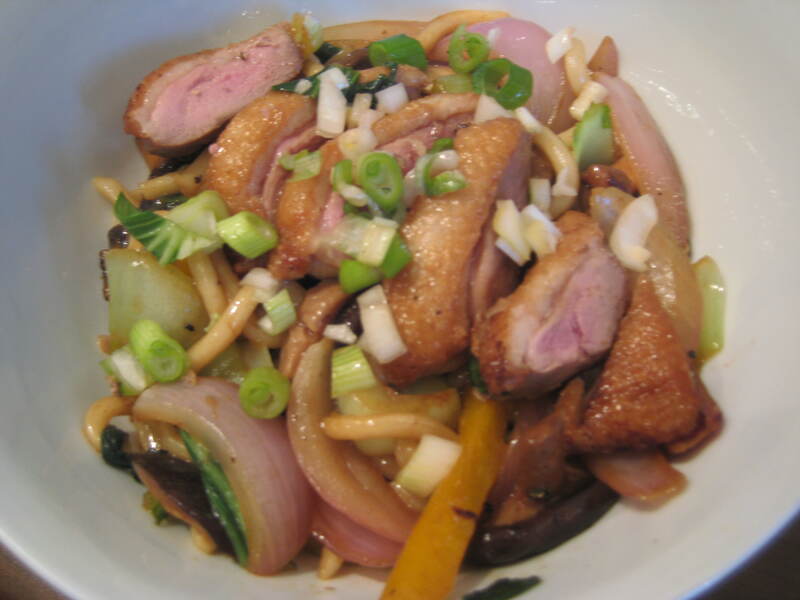 Divide the contents of the wok into two bowls and then place on top the sliced duck fillets. Finish off with a nice sprinkling of the spring onions and a squeeze of lime. 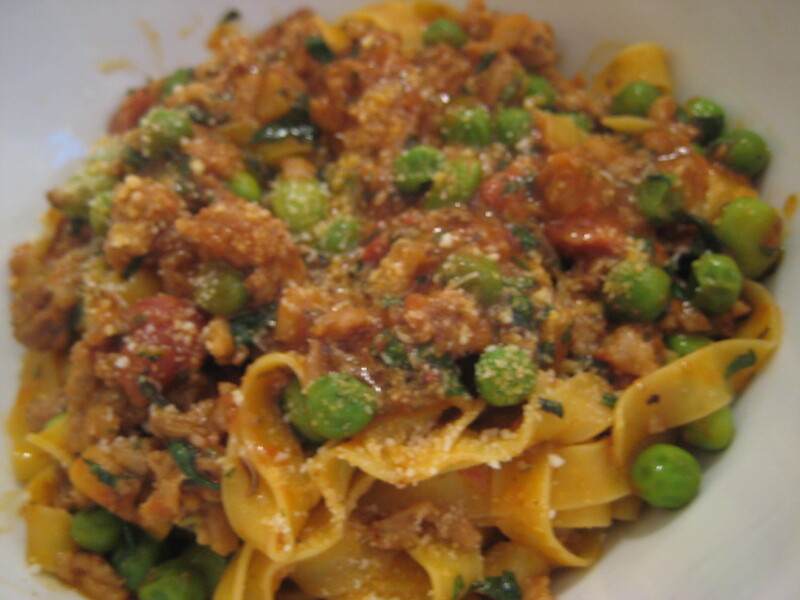 A really quick dish to make, great as a last minute dinner or for a lunch time treat. 1. Put a wok on to heat with the olive oil, whilst slicing the pork fillet into pieces approx 1cm thick. 2. Add the onion, green beans, mushrooms and pork to the wok and cook through. 3. 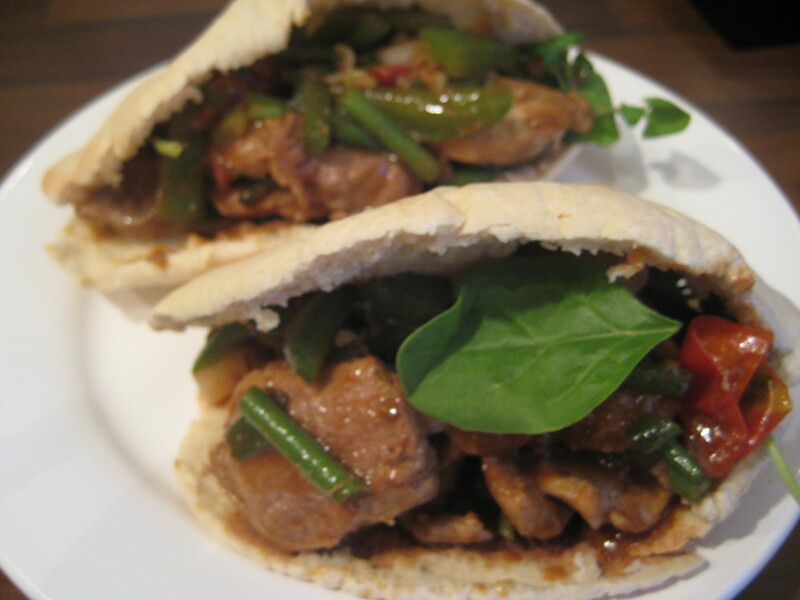 Once cooked, spoon in the hoisin sauce and cook for a further minute whilst warming your pittas. 4. Add the mixture to your hot pittas along with the chopped spring onions and mixed salad leaves. 1. pop your pasta on to boil whilst de-skinning your sausages and chopping them into bitesize chunks. 3. Add in the rest of the wine and soya beans and leave to cook for a few minutes until the soya beans are soft. 4. Drain the pasta and then stir into the sausage mixture, add the basil and parmesan, mix well and then serve.